Sergey Morozov, governor of Ulyanovsk region of Russia, joined Russia Today to speak on the “give birth to a patriot” campaign as a way out of the population crisis in Russia. 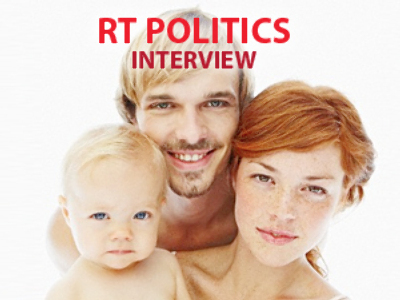 Russia Today: How did you come about that unusual idea (Today the governor has given people the day off to encourage them to try for a baby)? Sergey Morozov: It came out in 2005 when the present administration of our region was appointed by the President of Russia, and after analyzing the economic situation in the region we saw very interesting prospects for economic development in our region: first of all it is a good geographical position, rich natural recourses and many other factors. We came to the understanding that in a very short period we could do a great deal so that people living in the city of Ulyanovsk and the region could live significantly better than they had been doing before. But we also noticed that after the arrival of serious Russian and foreign investors, such companies as Mars of the U.S., French company Legrand, some Turkish and German companies, largely there has been not so many people capable of working in a new way and having new interesting ideas and good brains to work for these companies. Therefore we made a decision to carry annually on the territory of Ulyanovsk region a certain action. We named it “Give birth to a patriot of Russia on the national day of Russia” in order to not only honor women who give birth to our children but also honor those children who would be born on the June 12, the Day of Russia. RT: Please tell us about the results, have they been satisfactory? S.M. : Yes, of course, I am quite satisfied, I can tell you without going too far back that this year on this particular day, June 12, 78 children were born. To comprehend it correctly, I can tell you that exactly one year ago on that day there were only 26 newborn babies in the whole Ulyanovsk region. As you can see the difference is considerable. On the average in recent years 2006-2007 there are about 20-27, maximum 27 babies are born daily. This year on June 12 our dear women favored us with a great number of infants. RT: Is this clever idea will be taking off in any other Russian regions. Has any other governor been on the phone to you? S.M. : Yes, of course I think that this action could be easily copied in other regions because it allows not only pay closer attention on the situation with the birth rate and state help to the families. It helps to draw a significant attention of businessmen to the subject. I think we are among the few regions of Russian Federation that managed to make big industrial and business structures to participate in the action. And now every woman that goes on the maternity leave and give birth to a new citizen of the Russia Federation, receives not only state grants but also average or even full salary from the employer enterprise for a full year after giving birth to a child. I think this is a very good material support for young families and many regions can use this experience.